Send the sweetness of your love in the form of Mango Cake this summer. This freshly baked mango cake is definitely going to gratify your taste buds and let you experience an altogether level of pleasure. 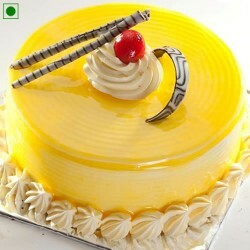 The cakes are prepared using the premium quality of mangoes during the season. You can buy mango cakes online with our express delivery option which allow you to send mango cakes, the same day, next day and even at fixed time too. It will be sure to impress Mom and make her feel delighted with the taste of it.